Warios Weihnachtsmärchen (English translation: Wario's Christmas Tale) is the name of an 8-page comic published in the June 1995 issue of the German Club Nintendo magazine. It is an adaptation of Charles Dickens's famous story A Christmas Carol, with Wario acting as the leading character Ebenezer Scrooge. The story is also indirectly based on the game Wario Blast: Featuring Bomberman!. Wario, about to fire his clerk Bomberman. Translation of Wario's dialogue line here: "Vacation? How dare you ask me for that?" It is December. Wario runs a Bomb Shop, and Bomberman works as a sales clerk in the shop. The latter can be seen giving an ordered "marzipan bomb" to a Kremling. When Bomberman pauses for a moment to rest, suddenly Wario opens the door, shouting at him and commanding him to work. While Bomberman resumes work, Wario watches TV in an adjoining room. The next shopper Bomberman has to wait on is Kid Klown who requests a "surprise bomb". When Bomberman asks his boss what to give his client, Wario grabs Kirby, who is shut in a small cage in the shop, and paints him black. He puts him into a small packet and delivers it to Kid Klown, gloating. When Kid arrives at home and opens the packet, Kirby angrily jumps out. Kid Klown is mad at Wario too, as his surprise bomb turned out be a "twaddling Dream Lander". In the meantime, in Wario's Bomb Shop, Bomberman carefully asks his boss for getting some days off for Christmas. Wario, however, is outraged at this request and spontaneously fires him. Then he goes home, leaving behind the sad unemployed Bomberman. Dreaming of money, women, and power, Wario suddenly sees a ghost floating over his bed. The ghost resembles Toad and claims to be the Ghost of Past, coming to show Wario moments of his bad past. Filled with fear, Wario sees a scene of him and Mario as babies, building sand castles on the beach. The Ghost tells him that he has been mean to all people, resulting in Mario having a lot of friends and Wario barely having any. Another scene depicts Mario and Wario's graduation ball. Wario wanted Toadstool to become his girlfriend, but due to Mario being way nicer to her, she danced only with him. Crying, Wario admits that he has always been nasty. Another ghost appears, introducing himself as the Ghost of Present, and looking like Link. He shows Wario what people think of him right now: Bomberman is crying, as he has no money to buy presents for his friends. Kid Klown and Kirby, in Kid's house, angrily play darts with a target depicting Wario's face. Wario is horrified and asks what to do. Before he can do anything, however, the Grim Reaper-like Ghost of Future shows him a situation of the future: Two children are entering a toyshop, asking for Wario games. The sales clerk replies that nobody cares about this "mean guy" anymore. The children admit that he's correct and decide to buy the latest Mario game instead. Wario at his own grave. The Ghost of Future takes Wario to yet another place, a cemetery. 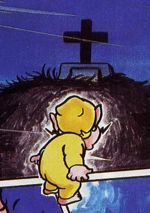 On top of the hill, Wario sees his own seedy grave. Even more horrified of this outlook, Wario decides to change his behavior. He goes to the Bomb Shop and tells Bomberman (who is inside the shop, for some reason) that he is employed again and also gets days off. Then he drives to Kid's house and presents them some cookies. As Wario decided to spend Christmas with his former friends, he goes to Mario's House and apologizes for his bad behavior. Mario, dressed as Santa Claus, is forgiving and lets him in. Wario enjoys the Christmas party together with Mario, Toadstool, Yoshi, Diddy Kong, Luigi, and Donkey Kong. This page was last edited on February 13, 2018, at 10:02.